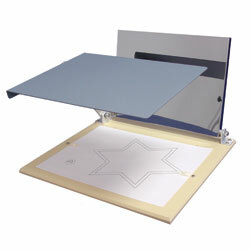 This mirror tracer requires subject to reverse visual cues and trace a mirrored star pattern onto paper. Both this unit and the automated mirror tracer have a shield to hide subject's hand from view while tracing. Mirror and shield fold down for easy storage. Package of 100 Replacement Tracing Stars for Mirror Tracer, Model 31010.